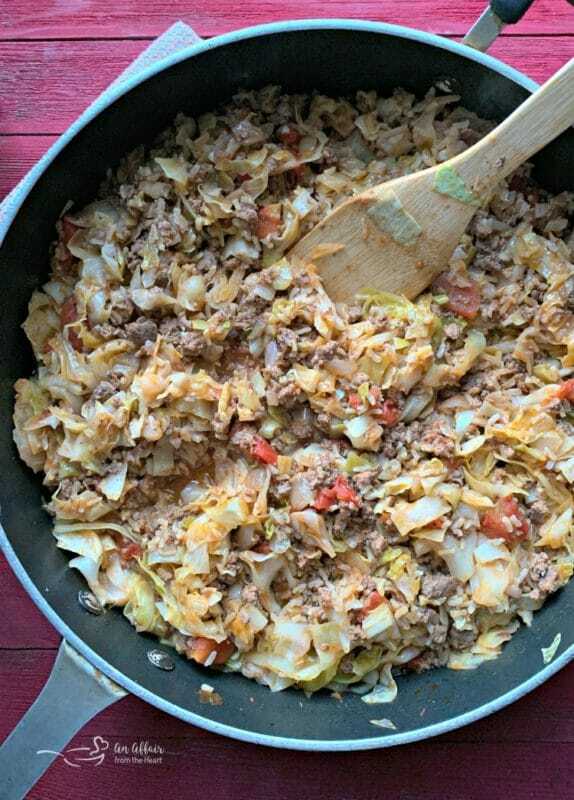 This Unstuffed Cabbage Roll Skillet is a one pot meal, mimicking those time consuming cabbage rolls, ready to eat in minutes. An easy and delicious weeknight meal. 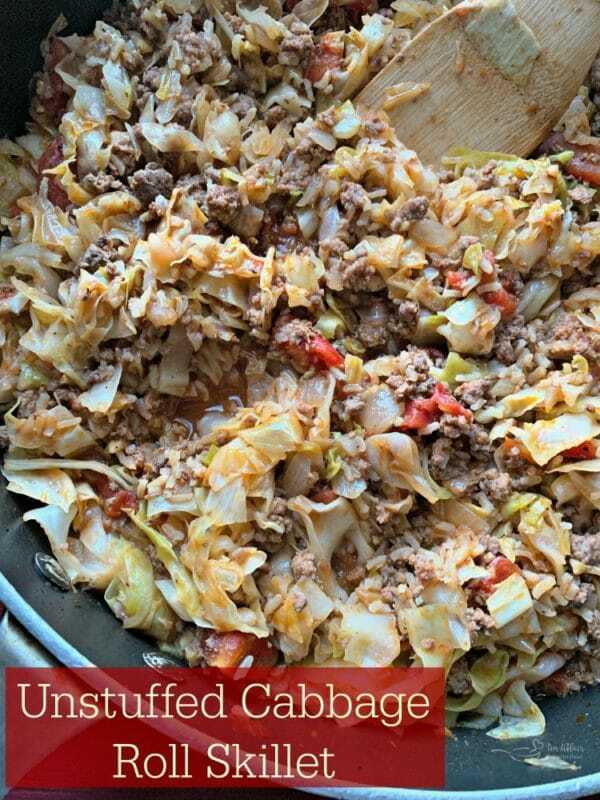 Unstuffed Cabbage Rolls? Say what? You bet!! There is nothing like making a version of a super time consuming recipe quick and super duper easy! Am I right? My family loves cabbage, and when I make my stuffed cabbage rolls, they practically cheer. I don’t make them very often though, because they do take quite a bit of time. Recently, I had purchased my corned beef and cabbage to make on Sunday, and then decided to push it back a week so my son and our “5th child,” my daughter’s boyfriend, would be home from college. They both love that meal. So, I popped the corned beef in the freezer and the cabbage in the fridge. Late Sunday night, I got an email that my youngest son would have an impromptu soccer practice Monday night. Monday was already shaping up to be a crazy busy day, and I was trying to think of something I could make in a short amount of time, using the cabbage was a bonus. 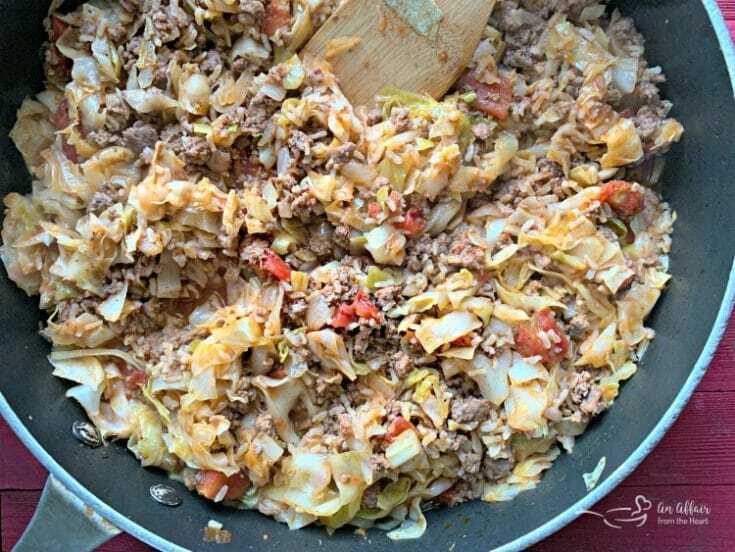 I have seen different versions of this meal over the years, and had planned to try it when I made this Inside Out Cabbage Roll Soup, (also a wonderful recipe) and I decided Monday was the day! I asked the family as we ate, “so what do you think? 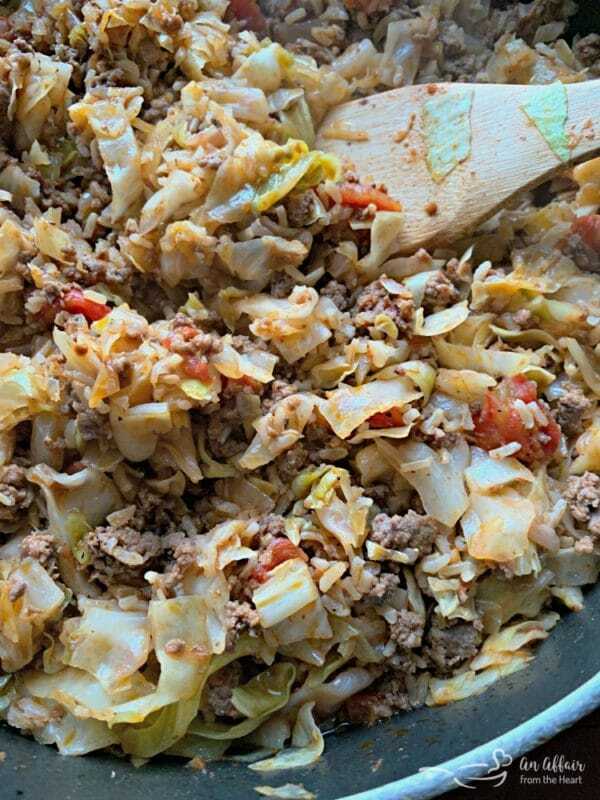 Is this recipe a keeper?” My husband replied “I think I actually like this better than cabbage rolls.” SCORE —a keeper indeed! See, typically that doesn’t work in my favor. Usually, I am never quite lucky enough to have the easy one pot meal that is done in minutes be the chosen one over something that takes me hours to make! Hence the reason why I don’t gamble. If given a 50/50 chance on something, I always lose. I always figure money that would be gambled is probably better spent on shoes or something else anyway! It’s silly actually, just how easy this meal is to make. Brown your ground beef with some onion, (in a pinch, you can always replace a fresh onion with chopped dried onion) and the rest is added in afterwards. 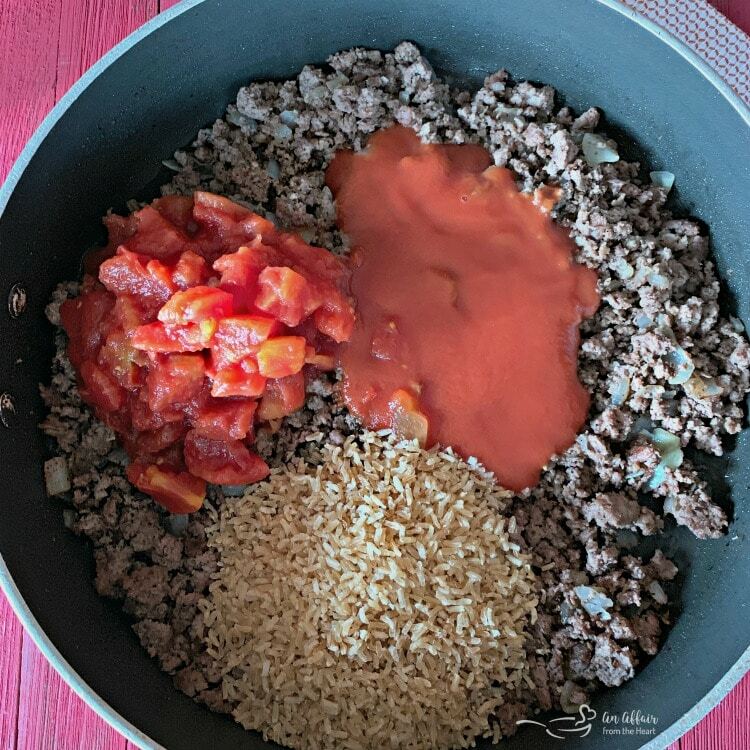 Water, tomato sauce, diced tomatoes and brown rice are added to the ground beef, stirred together, then top with chopped cabbage. Simmer until the cabbage wilts and the rice cooks. Serve it right out of the skillet. Less Dishes? Please sign me up for less dishes!! 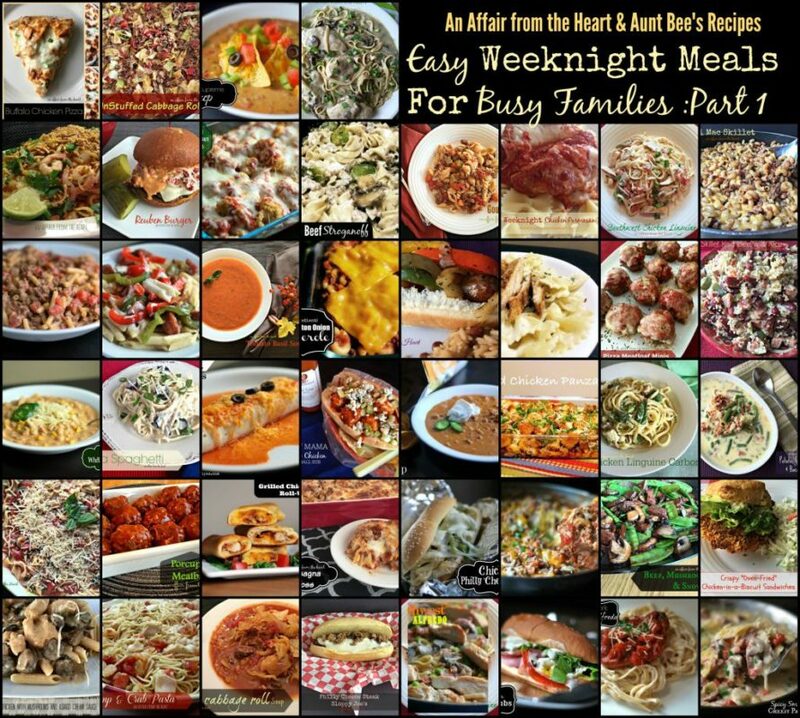 Easy Weeknight Meals are recipes I can get behind, how about you? In fact, I pride myself on having loads of recipes that make your time in the kitchen well spent. Delicious meals, fewer ingredients, fewer dishes. Plus — it’s keeping us out of the drive thru on those nights it feels nearly impossible to get a decent meal on the table for our family. Skillet Meals are one of my favorites. Being able to make a meal right in one pan, and set it on the table and get to eating, makes my life so much easier. What types of kitchen products make this recipe even easier? A Large Skillet with a Lid is necessary. The cabbage takes up lots of room! I love using my Bamboo Utensils for skillet meals. They actually are my favorite of all of my utensils! Of course a good cutting board and a nice sharp knife will make prep go nice and smooth. This meal is great if you are trying to add fiber to your diet. The tomatoes, cabbage and brown rice are perfect for that. Brown rice has less carbohydrates than white rice, so using it helps with eating ow carb, too! I’m hungry! Let’s get to dinner, shall we?? When browned, add tomatoes and tomato sauce, stir. Add rice and water, stir. Fold cabbage into sauce. Cover and simmer on medium low for about 20-25 minutes, stirring a occasionally. Rice and cabbage will be tender. Salt and Pepper to taste, serve right out of the skillet! 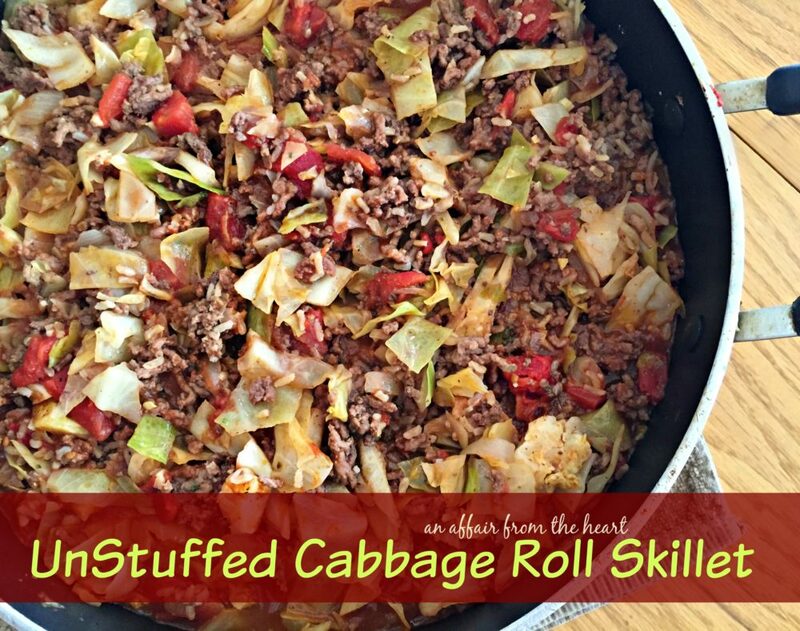 This is SO much quicker and easier than regular stuffed cabbage rolls. (Which are one of my favorite meals) I can’t wait to try this! This is a great recipe…I add a can of drained sauerkraut to it and it zips it up a bit. That sounds great! I will have to try it! 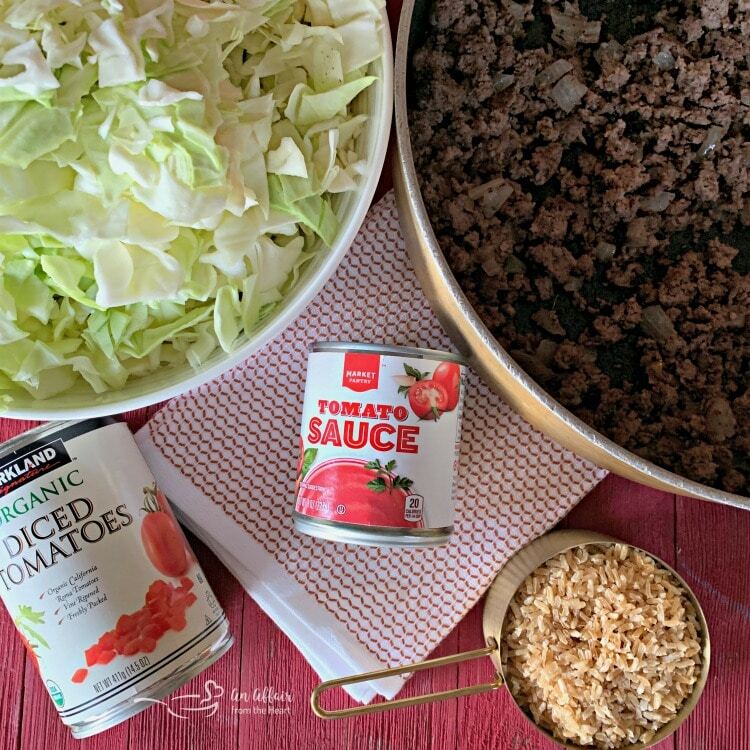 this is wonderful and quick, I changed it from plain diced tomatoes to the ones with green chilies since we all enjoy the spicey side of food and everyone who has ate it wants the recipe, Also for you who garden each year, did you know you can chop and freeze your cabbage, keeps great. Sounds great!! thanks for the tip on the frozen cabbage!! Perfect!! I was going to make stuffed cabbage until I found this recipe. It came out so good. I did add a few things parsley, salt, worcestershire sauce, beef granules, and a tiny bit of brown sugar. I also used regular long grain rice because I didn’t have any minute rice on hand. I added an extra cup of water and cooked it about 15 minutes extra to make sure the rice was cooked all the way. It came out so yummy! It’s my new go to cabbage recipe. So happy you liked it! It’s one of our favorites! I like the idea of this. Taste the same but so much easier! I love how easy this recipe is. I love stuffed cabbage rolls but they are such a pain to make. I will definitely give this a try this week. What a clever way to eat your favorite food without investing much time in it and as well as maintaining all the flavors. Lovely! 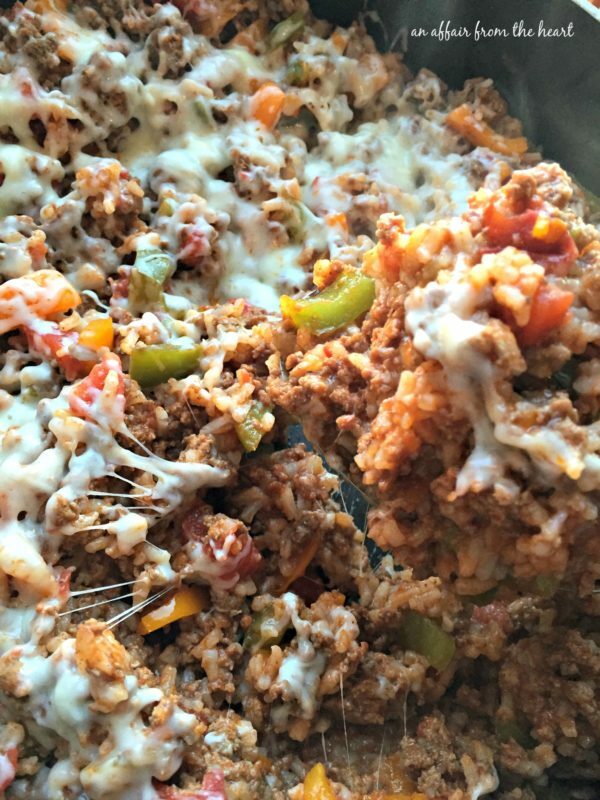 This is a fantastic one pan meal! So much quicker and easier than the classic cabbage rolls that take so much time to roll. And looks so delicious! This would be great for kids! I have tried to get mine to eat stuffed cabbage rolls but they never would. I am making this for them! I hope they love it!! Omg this totally speaks to my Polish lazy heart! Ha. I LOVE cabbage rolls but you’re right, they’re so time consuming! This is perfect for a busy weeknight dinner when I want all of the flavors in much less time. Thank you! I was looking for the perfect corned beef and cabbage recipe. This one looks easy enough for me ! can’t wait to try it. Cabbage is such an underrated vegetable! I’m always looking for quick and easy weeknight meals and this one looks perfect. Thank you for sharing such a tasty recipe. 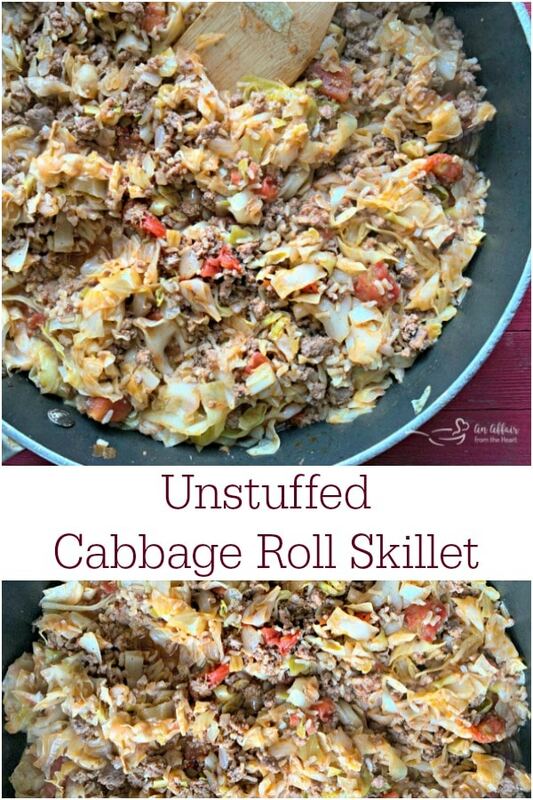 I love the idea of an unstuffed cabbage roll! I can’t wait to try this! I’ve been eating so many sweets that I’m craving delicious comfort food like this one. I love that you’ve unstuffed it! I think you get more of an equal amount of ingredients in every bite! 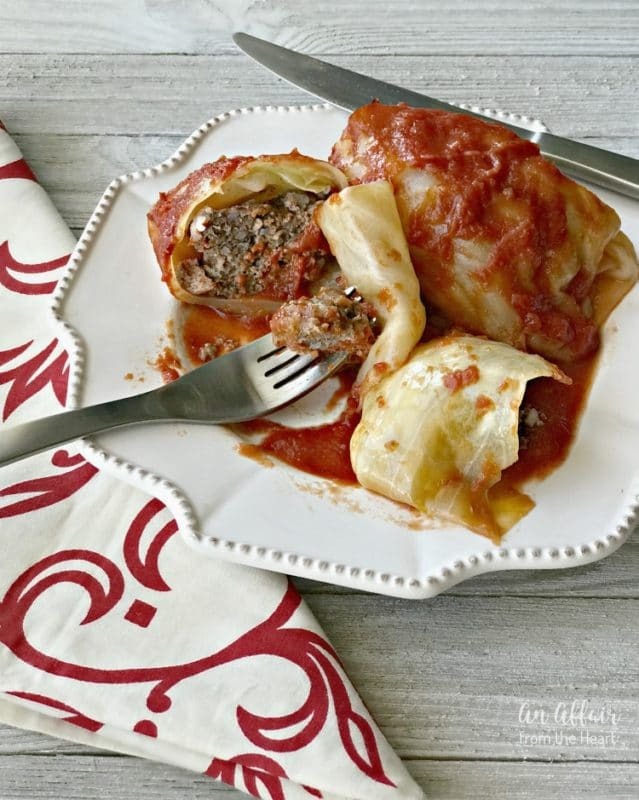 The amazing taste of homemade cabbage rolls without the blanching, stuffing and rolling? Sign me up! I love the simplicity and deliciousness of this recipe! Five stars for sure! Oh, yes! Skillet one pot meals are my favorite, especially when you need something quick. This is delicious and so easy to put together! What an awesome dinner idea! I love how easy it is to make! This skillet meal is speaking my language!! I love that it’s just one pan, and not a million ingredients. YUM! 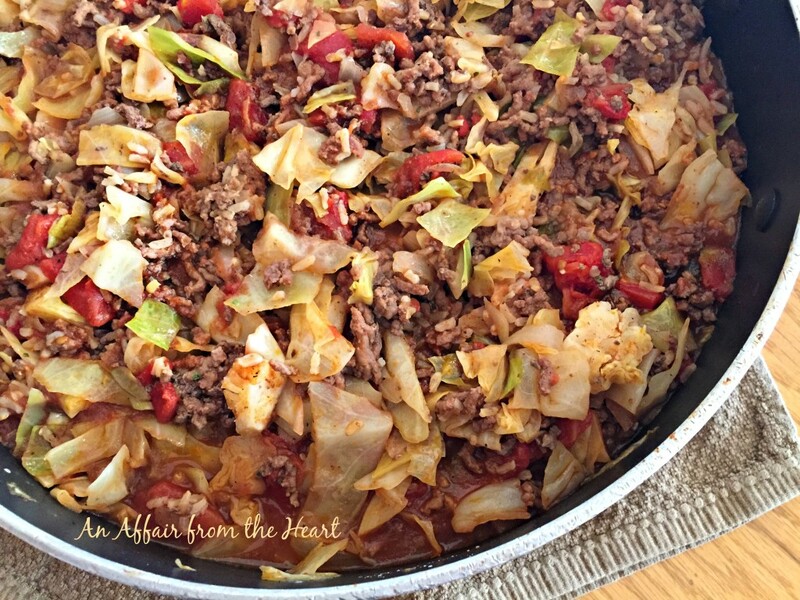 Totally in love with stuffed cabbage rolls and want to get married to this skillet so I don’t have to do all the work! I wonder since I’m already married if Brooks will be okay with me making it for dinner every night for the next month or two? I see a lot of recipes where they add onion with the ground beef and then drain. Why? Brown your ground beef, drain, then add your onion, otherwise you’re losing flavor.